As I mentioned earlier, my sounds come from a macmini. So I needed a nice keyboard. I was looking at the products, which are on the market, but there was and is nothing which suits my needs. The base of the keyboard is a keybed from a Yamaha P80. 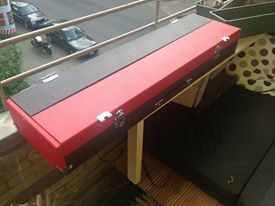 The goal was, to have the transportcase integrated into the keyboard (like Doepfer does). Another thing to achieve was, to easily add a second keyboard to the rig. I started planing in a CAD application and got the materials from the local DIY market. After a few hours that’s the result. 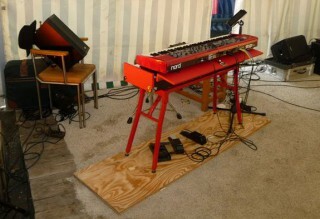 Even if it looks not that stable with the nord on top of it, it’s not wobbeling at all.